GAITHERSBURG, Md. 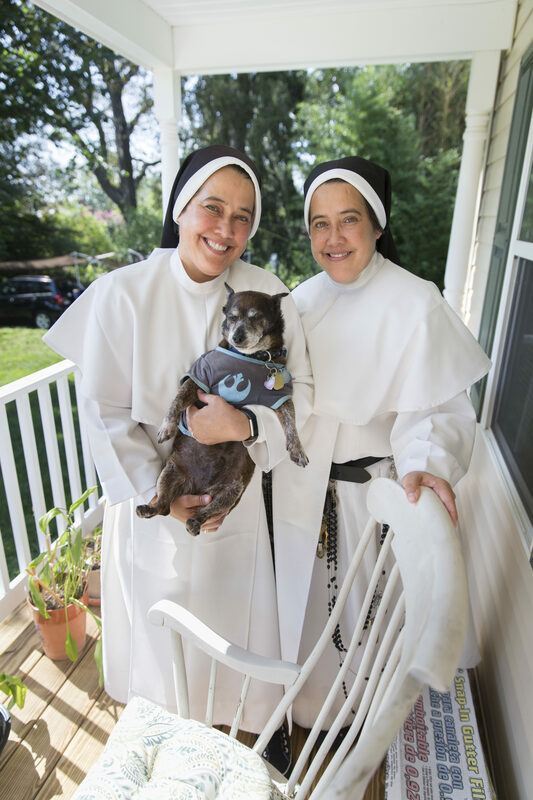 (CNS) – As identical twin sisters, Sister Judith and Sister Maristella Maldonado not only look exactly alike, but as members of the Dominican Sisters of Our Lady of the Rosary of Fatima, they dress alike, wearing that order’s white habit and black veil with white trim. And they also have the same outlook on life and approach to their faith, embodying what Pope Francis calls “the joy of the Gospel” in their ever-present smiles and happy demeanor. That spirit helped draw them to become Dominicans after their parents moved the family back to their native Puerto Rico, and the Maldonado twins were inspired by the faith, service to families, pride in Puerto Rican culture and sense of fun shown by those women religious. “They were a happy community, always smiling,” said Sister Judith. But the twin Dominican sisters did shed some tears recently, at an Aug. 5 farewell party at St. Martin of Tours Parish in Gaithersburg to honor them and Sister Cruz Vega, another member of their religious order. The sisters have received new assignments in Puerto Rico. Sister Judith will be the religious community’s general secretary and a member of its General Council, and Sister Maristella will be director of the congregation’s family ministry and will assist her sister, the new general secretary. Sister Cruz was named prioress of the order’s motherhouse and to assist at its Fatima Sanctuary. At the farewell party at St. Martin, hundreds of people from different backgrounds and ages who reflected the parish’s multicultural community gathered in the school gym. Father Richard Gancayco, the pastor, offered an opening prayer and thanked the sisters. Sister Maristella cried as the girls’ choir sang in their honor. Since she began serving in the parish in 2012, her ministry included coordinating that choir. She noted that she had known some of the girls since they were very young. “They grew up with me,” she said. Sister Judith, who joined her sister at the parish one year after serving in family ministry at nearby St. Rose of Lima Parish in Gaithersburg, was presented with an autographed soccer ball signed by the altar servers, whom she had worked with at St. Martin. “They cried, and I did, too,” she said. The three departing Dominicans have been succeeded at St. Martin by three other members of their religious community who will continue their family ministry at the parish: Sister Mariana de Jesus, Sister Esther Ortiz and Sister Inocencia Olmeda. Sister Judith added: “As missionaries, we leave our families to go wherever God asks us.” She noted that at St. Martin, “we found a family,” a family whom they will remember in their hearts, through love and through prayers. “Thanks for opening your hearts and lives to us,” she wrote. On Aug. 8, the feast day of St. Dominic, who along with Mary, is their community’s patron saint, Sister Judith and Sister Maristella spoke to The Catholic Standard, Washington’s archdiocesan newspaper. They were joined by their Chihuahua, Brindel, their faithful companion at their convent, chapel and office. In three days, the sisters and Brindel would fly to Puerto Rico for their new life there. On Aug. 9 they would mark their 32nd anniversary of entering the Dominicans. The twins turned 51 in July. As women religious, they chose personal mottos. Sister Judith’s is “Loving as God loves,” and Sister Maristella’s is “Happiness of God.” They said in their ministries, they have sought to bring God’s love and happiness to those whom they have served. The twin sisters, who are natives of Hartford, Conn., both have degrees in social work. Their family ministry at St. Martin’s Parish included preparing people for the sacraments of marriage and baptism, helping counsel youth, and assisting parents facing challenges in their immigration status, health, employment or with family issues. And in all their work, they encouraged people to put Christ at the center of their lives, a lesson their mother taught them long ago – the importance of “primero Dios” (“God first”).